Back for the second year in a row, Montreal’s Virginie Brunelle brought another bold, visceral work to the Vancouver International Dance Festival. Last year she presented an intense work about lost love, and this year’s piece shared a similar sense of anguish and heartbreak, but featured six dancers and involved a more developed narrative, with dramaturgy provided by Stéphanie Jasmin. Amidst all the pain is a simple kind of beauty. Brunelle is able to take small movements, such as a distinct look with the eyes or a deep breath and infuse a great deal of meaning into it. 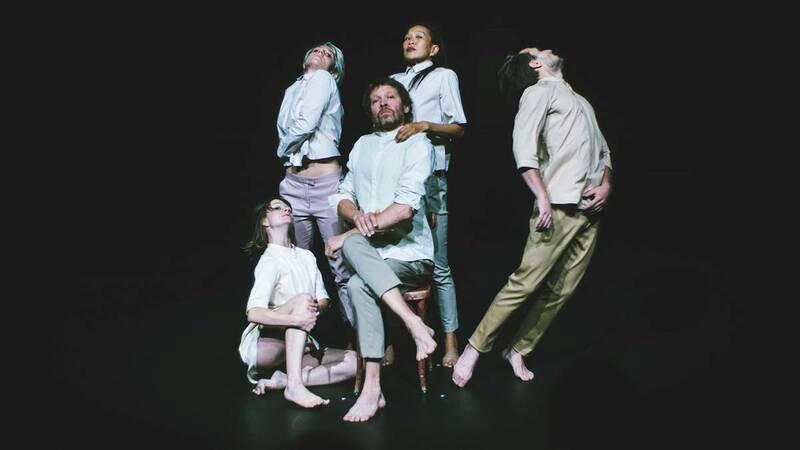 The piece began with one dancer seated in a wooden chair and the others arranged around him as if posing for an awkward family photo. In unison, they took long, deep breaths and then exhaled suddenly. This went on just until one might wonder if they were going to move from that position, and then they disbursed quickly flinging themselves in all directions. The mix of opera and classical music, most of it associated with happy occasions, added an interesting contrast to the obvious anguish and sorrow being displayed through the dancers’ performance. With distinct use of facial expressions such as fake smiles, eye contact, and blank, solemn looks, the dancers all coloured their movements with rich emotions. Near the end of the piece, the dancers removed some items of clothing and continued to ramp up the intensity, flinging themselves around the stage and into each other’s arms. The impressive jumps led up to a finale of three couples dancing in unison before they moved back into position for their awkward family photo. The last image was a heartbreaking scene with one dancer becoming the ignored party in a love triangle. Through a vivid display of pain and nostalgia, Brunelle has created a moving work full of intensity and stunning performances from her dancers.